Santa Claus is comin’, and is running to your town! 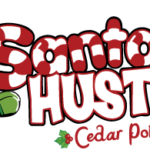 Join us and many of your Santa friends at the Santa Hustle Cedar Point 5k and Half Marathon on Sunday, December 10, 2017. 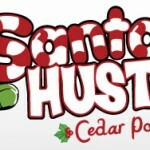 See Sandusky unlike ever before as thousands of Santas race along the streets and throughout Cedar Point. Jingle all the way through the course with candy and cookies, festive music, creative Christmas images, and so much more, it is all designed to get you in the perfect holiday mood. It is bound to be a Christmas tradition you do with your family and friends year after year. And to make your jingle tingle, NEW for Santa Hustle this year includes a finisher medal for the 5K and Half Marathon, lightweight performance hoodie along with the Santa Hat and Beard. So, if you like dressing like Santa Claus, enjoy dancing to some holiday music, devouring candy, and joining in on an epic after party then grab your favorite friends and family, get in the holiday spirit, and make your way to the Santa Hustle 5k & Half Marathon. Nearest Parking: The start and finish will be at Cedar Point Parking Lot. Parking will be available at Cedar Point for Free or a shuttle service will be offered from Castaway Bay to Cedar Point and Back.